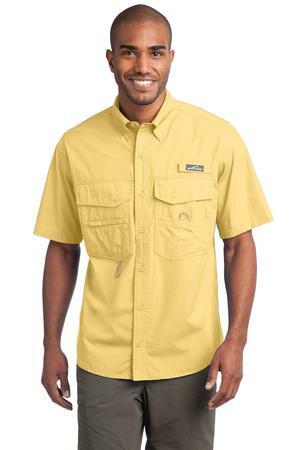 This Short Sleeve Fishing Shirt features a built-in rod holder, two large fly box pockets with hook and loop closures, and a utility loop and tool holder. It is made of 3.5-ounce 100% cotton poplin with a 100% polyester mesh upper back lining and has a zippered chest pocket, cape back with mesh ventilation and hook and loop-fastened collar points. Be the first to review “Eddie Bauer – Short Sleeve Fishing Shirt Style EB608” Click here to cancel reply.